Studies using functional MRI (fMRI) examine the functional aspects of the brain during working memory tasks and may explain some the memory issues seen in Fibromyalgia. A study by Jeehye et al. (2012) illustrated altered brain activity related to Fibro fog, as seen in working memory, implicit memory, and executive control tasks. Jeehye and colleagues examined brain functioning of 19 Fibromyalgia patients during a working memory task, using an N-back task, and compared it to that of 22 healthy controls, in hopes of determining which specific brain regions may be affected by Fibromyalgia. An “N-back” task is when you are given a series of numbers and when you see a specific number, you are asked to report which number appeared X number back. So, if a series is 546789470897, you might be asked to report which number appears three numbers back every time you see a 7 –so the answer would be 5, 8, 0 for the list above. Obviously, this task gets harder and harder as you need to recall numbers further and further back from the target. This N-back task is commonly used to measure working memory. Jeehye et al. sought to examine whether there were changes in brain function among Fibromyalgia patients when activating working memory, providing more evidence as to whether the cognitive difficulties experienced in Fibromyalgia are caused by the pain or a result of the co-morbid depression. fMRI results showed reduced activation in three areas (the Dorsolateral Prefrontal Cortex (DLPFC), Ventralateral Prefrontal Cortex (VLPFC), and the inferior parietal cortex) among the Fibromyalgia group when compared to the healthy controls. These areas are each individually important in the n-back test. The prefrontal cortex is believed to be responsible for keeping track of new information as it is given and shifting older information back, allowing one to remember what number was N-back as they continue to read the numbers waiting for the target to appear. The DLPFC allows for task-appropriate responses, and the VLPFC allows for responding and remembering specific plans (that you are looking for the number N-back). The three must work together to allow for completion of the n-back task and problems in the functioning of these areas would cause Fibromyalgia patients to have trouble organizing their thoughts and remembering basic tasks. The differences in these areas were also correlated to increased depression and anxiety, which have been noted in previous studies of depression and anxiety. The authors of this study suggest that because these same changes in the right DLPFC have been noted in previous studies of anxiety patients, that depression and anxiety may be partially responsible for the cognitive issues seen in Fibromyalgia. Even controlling for depression and anxiety the Fibromylagia group had lower activation in the inferior parietal cortex. Differences in the Ventral Dorsal PFC (responsible for understanding and encoding verbal information) were noted possibly explaining why Fibromyalgia patients have trouble encoding and retaining verbal information. The results of this study clearly identify that the activation of specific brain substrates is different in Fibromyalgia patients. While some changes may be related to the depression and anxiety, others appear to be tied directly to pain. What we can’t be sure of is whether these changes cause Fibromyalgia or Fibromyalgia causes these changes. 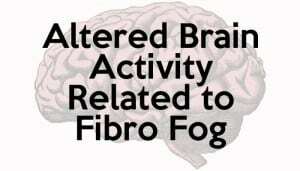 My hubby might just understand my Fibro fog now. Thanks for this validating article! This was a great article…validating. Thanks for keeping up with the research and letting us know about it. I think my hubby finally understands about my Fibro fog. Thanks.